The ArduPilot Mega 2.6 is a complete open source autopilot system and it was the technology used by the winners of the prestigious 2012 UAV Outback Challenge & the SparkFun AVC competitions. The ArduPilot Mega 2.6 allows the user to turn any fixed wing, rotary wing or multirotor vehicle (even cars and boats) into a fully autonomous vehicle; capable of performing programmed GPS missions with waypoints. The 2.6 ArduPilot Mega revision of the ArduPilot Mega board has no onboard compass, which is designed for vehicles (especially multicopters and rovers) where the compass should be placed as far away from power cables and motors which are of magnetic interference. On fixed wing aircraft it's often easier to mount APM far enough away from the motors and ESCs to avoid this magnetic interference, so this is not as critical, however the Ardupilot Mega allows more flexibility withpositioning and is a good choice for all crafts. 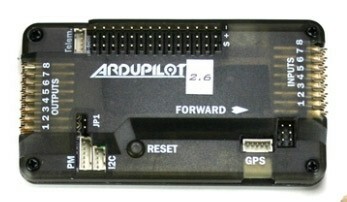 The ArduPilot Mega 2.6 is designed to be used with the 3DR uBlox GPS with Compass, so that the GPS/Compass unit can be mounted further from noise sources than APM itself. The Ardupilot Mega 2.6 requires a GPS unit with an onboard compass for full autonomy, If you are using the ArduPilot Mega 2.6 with a GPS module which has no compass sensor, you must use a stand-alone external compass. We recommend either the Triple Axis Magnetometer HMC5883L with this cable DF13 4 Position Connector 19 cm or the HMC5883L Extenal Compass unit with the 3DR V2 GPS unit. This new ArduPilot Mega 2.6 system works with the Power Module with integrated 5.3V regulator and current and voltage sensing to allow a clean power supply to the system. Onboard 4 MegaByte Dataflash chip for automatic datalogging. Optional off-board GPS, Mediatek MT3329 V2 or uBlox LEA-6H module. Pre solder with straight pin headers.